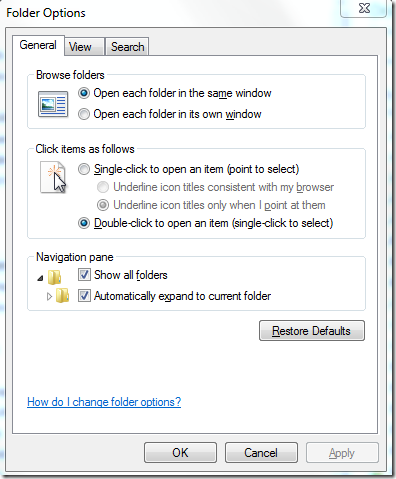 When you transfer your files and settings from from your old computer, using the Easy Transfer Wizard to your new Windows 7 computer, you may find that whenever you double-click on a folder, it opens new window. However this may not work!!! Problem: Folders may still open in new windows, even when set to use same window. Create a new user account, and move the documents and settings from the user account which is affected by this problem into the new user account. This is not an ideal solution – but I used this as a workaround before I discovered David Moore’s solution above. finaly it worked. Thank u so much. I used ur second solution. I know its a year on.. but I did a search and found this post.. just wanted to say.. thanks!! the 2nd solution also worked for me. Thanks Gareth – it’s nice to know it helped you out. Solution 2 worked! Thank You very much! thank you so much !! i followed sol 2.